Orlando, FL, USA — Ripley’s Believe It or Not! will once again pay tribute to the ancient art of sword swallowing by holding free sword swallowing performances as part of World Sword Swallower’s Day on Saturday, February 28. The very unusual – in Atlantic City, David Peyre-Ferry will attempt to swallow a sword while sandwiched between two beds of nails – then have someone smash a cinder block with a sledgehammer right on top of him! Performances typically start around 2:00 pm local time and culminate with an official swallow taking place at 2:28 pm to coincide with the 2/28 date. 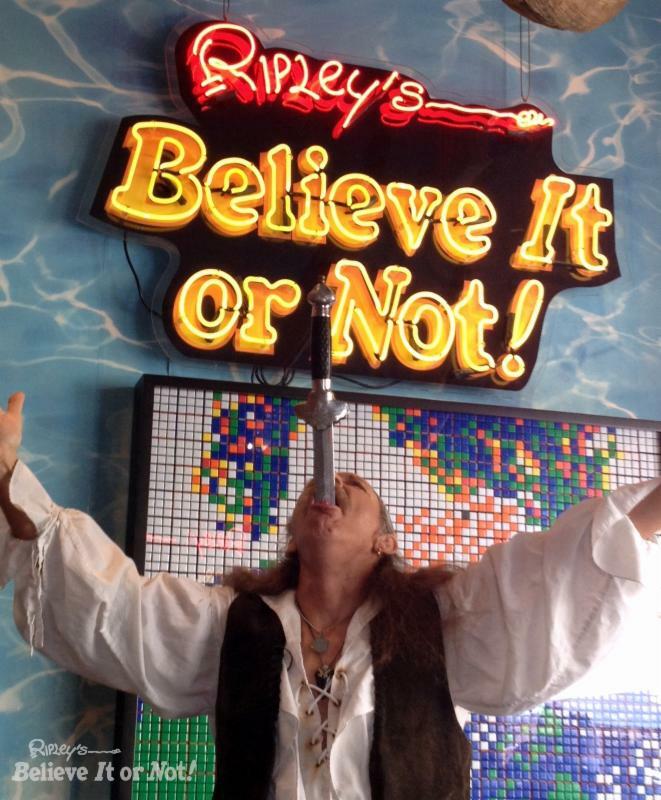 This will be the 8th annual World Sword Swallower’s Day celebration, founded by the Sword Swallowers Association International (SSAI) and co-sponsored by Ripley’s Believe It or Not! “We established World Sword Swallower’s Day to recognize the handful of people in the world who can do this and honor this art that is more than 4,000 years old,” said Dan Meyer, president of the SSAI. The event also raises awareness of the contributions sword swallowers have made to the fields of medicine and science and raises money for esophageal cancer research. Ripley’s Believe It or Not! has long chronicled the death-defying achievements of sword swallowers. 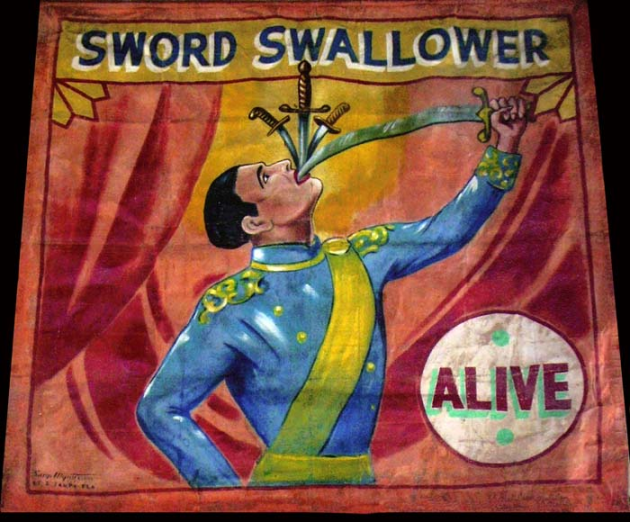 Sword swallowers were a prominently featured at the very first Ripley’s Believe It or Not! Odditorium at the Chicago World’s Fair in 1933. People who want to try their hand at sword swallowing – and not risk their lives – can use the Ripley iSword app to swallow a virtual sword and freak out their friends. All it takes is nerves of steel and lightning-fast reflexes. The app is available at the App Store for iPhone, iPad or iPod touch iOS 5 or later.